In our first podcast, Victor, Kevin and Brian review the second Star Trek pilot and first episode starring Captain James T. Kirk (or should we say James “R.” Kirk??). Why not start with the first pilot, “The Cage”? Simple. No Kirk, no Original Star Trek. End of story. But don’t worry, Pike-lovers. We’ll get plenty of the pre-Kirk captain (plus some throbbing alien heads and green slave women) during the double-episode “The Menagerie,” so just have a little patience, OK? This week, the TrekQuesters probe into the origins of the classic Star Trek universe , discussing a screaming Spock, a 200-year-old space trashcan, tin-foil contacts, and the lovely Yoeman Jones, er, we mean Yoeman Smith. Sorry about that, Andrea Dromm. Does absolute power corrupt absolutely? 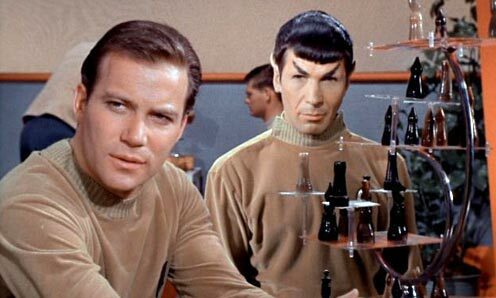 Could Kirk ever beat Spock in 3D chess? Do glowing silver eyes freak you out? Tell us what you think in the comments or send us an email at StarTrekQuest@gmail.com. Star Trek…The Ultimate Geek Pastime. Your hosts: Kevin, Brian, and Victor. Two thirty-something brothers and their dad. All life-long fans of the show. Our five-year mission: to review each and every episode of the original Star Trek television series. One episode per show for seventy-nine shows. After that, who knows? We encourage everyone to join the discussion and the fun by watching along with us, adding comments, and asking questions. Subscribe to the podcast via RSS so you’ll get the joy of each while it’s hot. 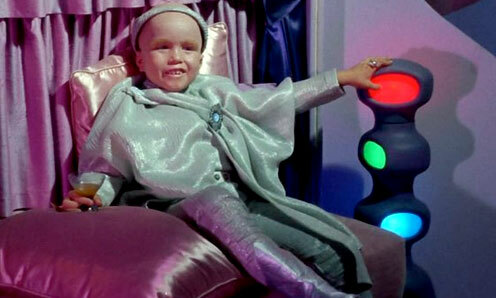 You can also email us StarTrekQuest@gmail.com.